It is an attestation or certification by the national accreditation body certifying that a conformity assessment body satisfies the criteria established by harmonised standards and, where appropriate, any other supplementary requirements including those defined in the relevant sector programmes, for conducting specific conformity assessment activities” (REG. (EC) N° 765/2008). Only testing laboratories and accredited certification and inspection bodies are qualified to supply to the market reliable, credible and internationally recognised certifications of conformity. In Italy ACCREDIA, applying the most rigorous standards, evaluates their competence, and their behaviour and performance is continuously and carefully monitored. ACCREDIA is also a signatory to international agreements of mutual recognition. 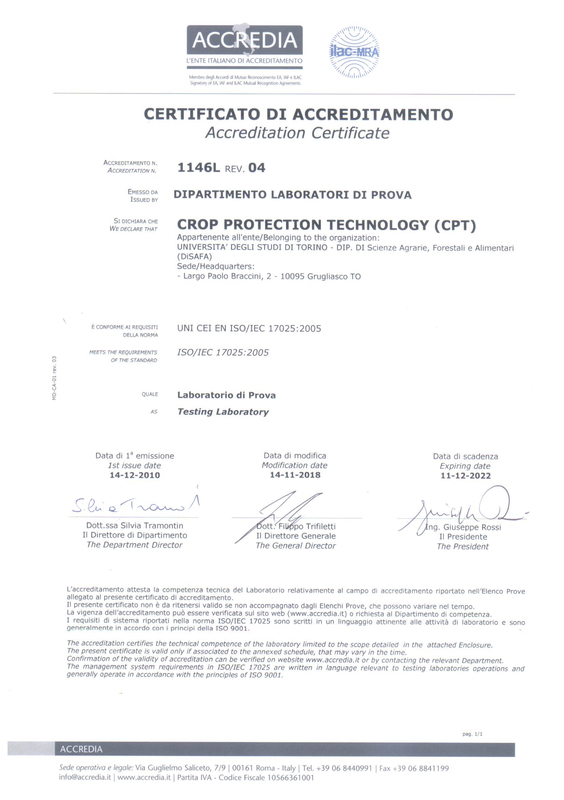 From December 2010 Crop Protection Technology Laboratory is accredited ACCREDIA for some tests on sprayers (and components) according to ISO/IEC 17025 (Accreditation n. 1146). From 2010 to 08/04/2019 243 Test Reports were issued, 149 (61%) with Accredia brand.